Part of the reason why we have been so quiet this year in terms of posts other than being busy adjusting to our new place, it was because we have been training for Ironman Cozumel. Two years ago when we volunteered for Arizona and after talking to a couple of friends we knew it was going to be our 2015 A race. When we came back from Arizona last year, we knew we wanted to sign up. To our surprise a couple of our IronTex teammates had already been talking about it and before we knew it we were having a team meeting at Fuzzy's after a practice morning to talk with our coach about it. It was so appropriate to talk about Mexico while eating tacos. What started with a handful of us ended with a total of 19 friends racing and total of 35+ counting the cheering crew. 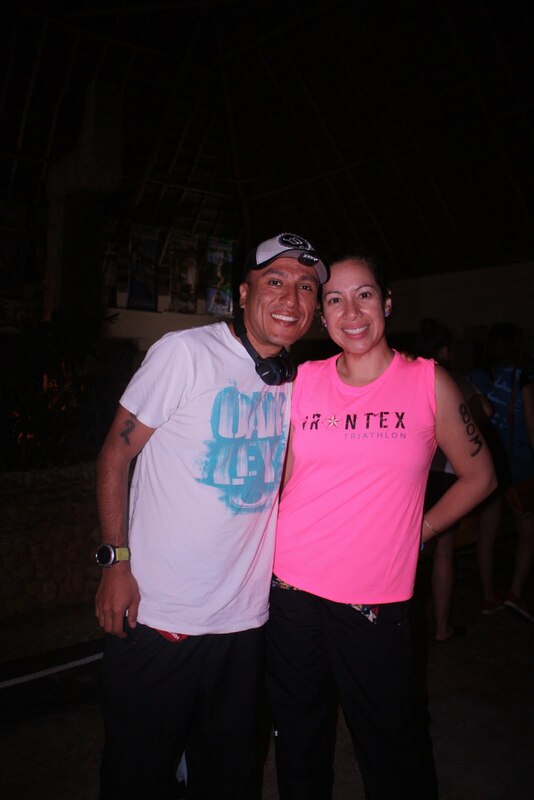 It was going to be an epic IronTex Cozumel takeover. Definitely one of the largest groups out there. Anyways, the year went by with the typical training. We did our Challenge AC 70.3 and we then got with our coach to set up goals and a plan for Cozumel. 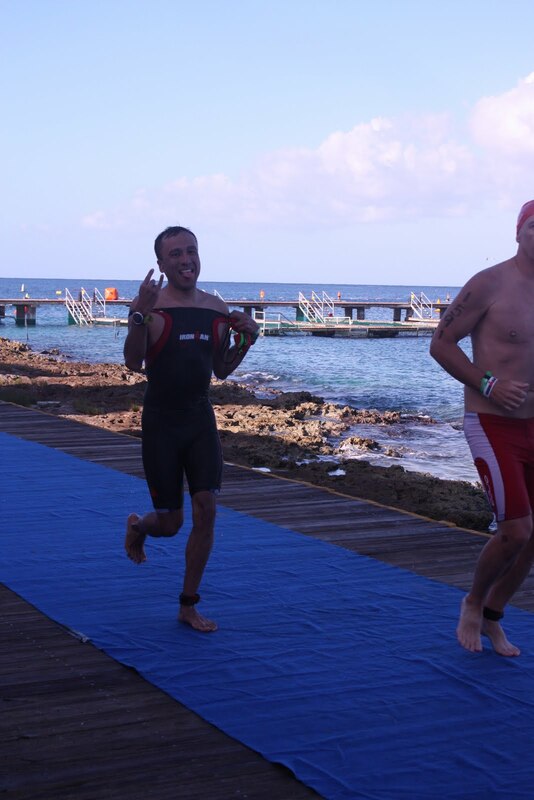 We knew we had a tough one since one of the toughest things of Ironman training is the mental training. The physical is doable but it takes your mind to places where you don't even know you could go We have had a taste of it during our IMAZ training when it was just both of us training since the majority of the team didn't have a late season race like us. We are happy to report that we manage it quite well. A few things we did differently this year were getting together with our local cycling club. This served a dual purpose. We were able to ride with people and also helped us push a little our limits since we knew we had a group to keep up with. It made us definitely stronger in that department. The swim front we got lucky and a pool opened up 1 mile from our house. This meant no excuses and our focus was to do the prescribed swims. Proof is that we improved a lot on our swim. So our training was just the usual swim, bike, run, eat, rest, work, repeat. We didn't have any major setbacks. No injuries, illnesses or any other issues. It was rather enjoyable for a change. We were seeing good progress each week and our bodies were responding to what the schedule was calling for. From the beginning a group of us wanted to be in Cozumel but didn't want to do the resort type of racecation. After doing Atlantic City where we stayed at a house we knew we wanted to go that route. We did our homework and found a company through a friend that lives there. Enjoy Cozumel is the name and they rent house/condos at reasonable costs. We had selected a house for 8 people near the center but during the summer the owners sold it. The company gave us a couple of options and we ended up at Villa Lloyd. Couldn't have asked for a better place. Ocean view, 3 bedrooms/3 baths. Everything we wanted and we had access to the ocean too simply by jumping off the dock. On top of that we didn't want to cook for ourselves or each other. We also found a chef service for all of us. Super recommend Emily and her team at Cozumel Chef if you are interested on something like this. Worked out great, they helped us plan our meals and the chef who was a local was awesome. So our trip planning took a few months which were totally worth the effort. Getting to Cozumel was not a direct flight from NY. We used miles and also had a return from Mexico City which made things a little harder, however we got to see Amy Dixon who was working a gig for United at Newark the morning we were leaving and she sent us off on our trip, she is simply amazing and such an inspiration (you can learn more and support her at the link above). Then we had a short stop in Miami to visit a friend and we were on our way. The entire flight (at least most of it) was ironman related. Was pretty cool to see the excitement on everyone's face. After doing customs and all that stuff we got with our house manager and we followed him to the house. We were then settled. The transportation is tricky but there are vans that take you everywhere. Packet pick up and all that was pretty easy. The convention center is the headquarters, bike transport is a few blocks from it so it works great. By Thursday (thanksgiving) we were set with packets, bikes and all. Friday morning was the practice swim in Chakanaab. We got to see the swim exit and got to see everyone too. Then we participated in an underwear run. It was a Texas team that put it together and they had gotten together with an organization similar to the humane society so the proceeds were going to them. What better than running in your underwear for a good cause. Our team decided to do a Minions themed run, about 25 minions took over the run that's all you could see. It was a blast. Then we were off to lunch back in the house with our chef :). Saturday rolled in and we knew we wanted to keep it slow that day. All activities were done by Friday so Saturday was bike drop off, bag drop off and back to the house to rest. Sunday alarm went off at 3:10. We had a pick up scheduled for 4:00 am. We got our rituals done and off we were. First in transition, only first place of the day. We were mostly calm. Transition opened, check the bikes and everything else, group picture and off to the shuttle to the swim start. I knew I was going to be in the 1:10-1:20 corral (rolling start) I saw some friends from the team and decided to go with them in the 1:00-1:10 swim. I knew I would be in the back of that pack but didn't care I was starting with friends. I ended up swimming for a good chunk with a friend and I ended up with a 1:17 more like 1:13-1:14 because I almost couldn't get up the stairs. So I was was right on target with my swim. Left transition with 2 of the guys that I started the swim with. So it was good to see them leaving too. Transition was quicker than most of my IM transitions. I was able to get a kid and got him to do what I needed. Perks of speaking Spanish I guess. We all knew the bike was going to be windy. The wind forecast was for later in the day so my strategy was try to get as much of it done before it sucked. Lap 1 I felt great, caught one of the guys and 3 of the girls from the team. One of the girls and I leap frogged almost the entire ride with me in the front for a good chunk of it (should've left her lead the way more) I was right on target at 1:54 the first lap. Got into town excited and started the second one. I knew as soon as I passed the bike start that it was starting to pick up, back into the wind and it was blowing. Got to town and I was at 2:15 for that lap. Then by lap 3 the wind started even earlier. Then I knew all I needed was to get through those miles and back into town to get the run going. Head down and put the hammer down as much as I could without blowing and trying to leave some for the run. Well that lap sucked, 2:30 for a total bike of 6:41. Far from my 6:00 goal (yet 2nd overall in our team of 19). All I kept thinking was about Res and her bike. I knew she would be hurting. Back into town the energy takes you in, the locals are awesome and seeing kids tell you "si se puede" (Yes you can) while cheering you gives you what you need to get through the last 6 miles. Transition was again faster than usual. I got one kid and he helped me get everything done. 1 mi/1:00. We did the first half in no time 2:40ish I was actually thrilled that I could go 5 hr and then have a 13:00 IM. Well that faded quick. We both started to feel the legs and everything else heavy. He couldn't jog because of his belly. I couldn't jog because the legs simply wouldn't respond. So we said lets just keep a constant 14:30' fast walk. We managed that at times. By mile 23 he was fading so I made him pick up a little jog to wake him up. Mile 24 and 25 were a blur, we saw coach Paul by Señor Frogs and he gave us that last boost to take it home. Then I told Jeff I was going in, I had told him otherwise earlier since he had 179 and was doing the Blazeman roll finish, I just got pumped and went in. Took my flag out, and into the chute. I couldn't believe going sub 15 much less 14:13 on my 4th ironman. I saw Jeff roll in and waited for him to hug him. We had done it! Seeing Matt at the finish was pretty awesome! We got our medals and stuff and Bob (another teammate) was there too. We hanged out until almost everyone finished. I was able to wait for Res and gave her her medal. She broke into tears after having a sub15 day too killing it with a 5:30 marathon that I can only dream of at this point. I was super proud of her. She had an amazing day too that I will let her tell you and post of her blog. We then went to cheer our last teammates in and saw our last teammate finish at 16:57 which was super impressive. Her first and she managed a tough day like she had done it many times before. We had seen her and her husband do their first tri 2 years ago and now we were cheering her on at the chute of her first ironman, super proud of her too. While this one was our 4th ironman it holds a special place in our racing, it was our first training alone without our team, learned a lot about ourselves through the months of training and also learned that sometimes having team support is great and we counted with them for our virtual accountability at the end of the day it is up to both of us to get it done. We held each other accountable, helped each other pushed through tough days and breakthrough workouts and also simply as moral support when we needed it. We love our teammates, miss them and wished sometimes we were training with them. Now we are a little more independent and have managed to get our training done, love our training grounds, our bike rides are seldom repeated, and our pool and trails are simply amazing. 2016 is turning to be a great year for both of us in the endurance sports world, more to come out in the next couple of weeks, you might have seen it already on our social media, but there is more to it coming. Until then... hope you enjoyed it and hope to share more exciting news soon.